It's December tomorrow, which can mean only one thing: it's time for the festive mash-ups to start falling from the internet like snowflakes from the great cyber skies. 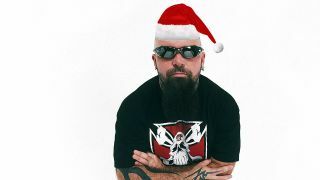 To get things started, one Christmassy-minded metal maestro has taken it upon themselves to combine the United States Navy Band's extremely buoyant rendition of Christmastime staple Sleigh Ride with Slayer's '86 thrash classic Angel Of Death. It works, sort of. But let's confront the elephant in the room here: they mashed up Sleigh Ride with a Slayer song and didn't even have the presence of mind to call it Slay Ride. That extreme wrong-headedness aside, this is likely your best chance of getting your gran to listen to Slayer this Christmas, so get stuck in.